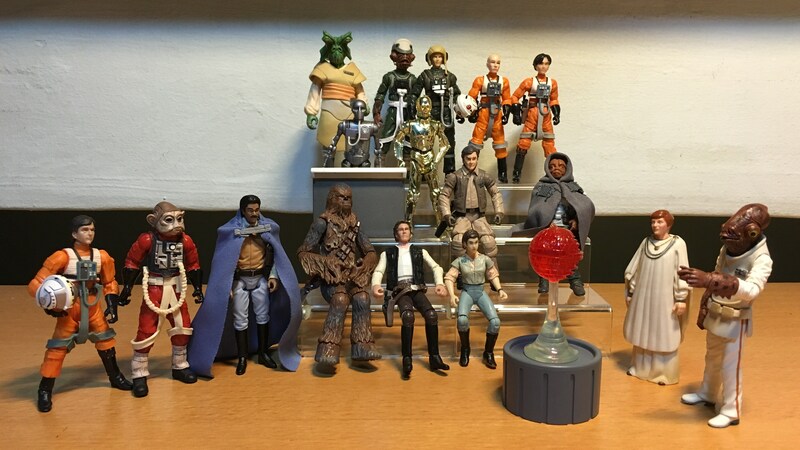 Hi world, today I’m showcasing a couple of Lando Calrissian figures that I have acquired. Lando Calrissian was an old acquaintance of Han Solo who had also engaged in the shady business of smuggling and gambling. He once owned the Millennium Falcon before he lost it to Han Solo in a game of sabacc. Since then, Lando had a career switch and he became an entreprenuer, setting up a small mining operation and becoming the administrator of Cloud City on the planet Bespin. During the Rebels’ evacuation of Hoth, the Millennium Falcon‘s hyperdrive was damaged, and Han Solo sought help from his old friend Lando to repair it. Unfortunately the Empire had arrived at Cloud City first and forced Lando to betray the Rebels under the threat of taking over the city. 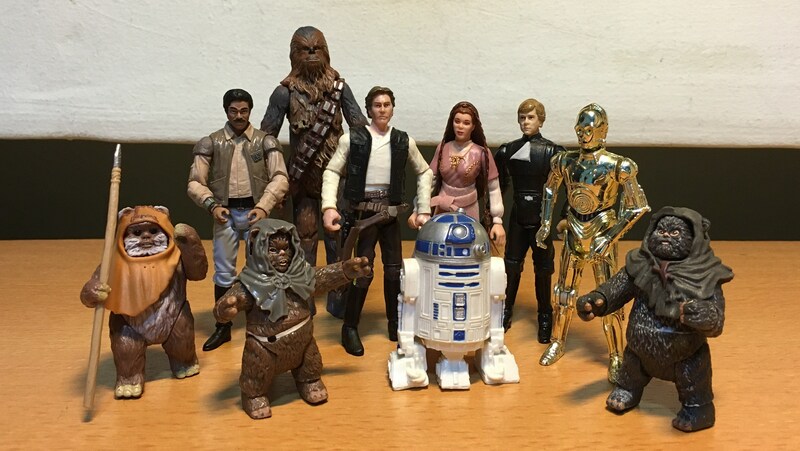 But when Lord Vader kept changing his deal with Lando over the custody of Princess Leia and Chewbacca, Lando decided to help the Rebels escape. However, Han Solo had been encased in carbonite and was taken away by the bounty hunter Boba Fett. 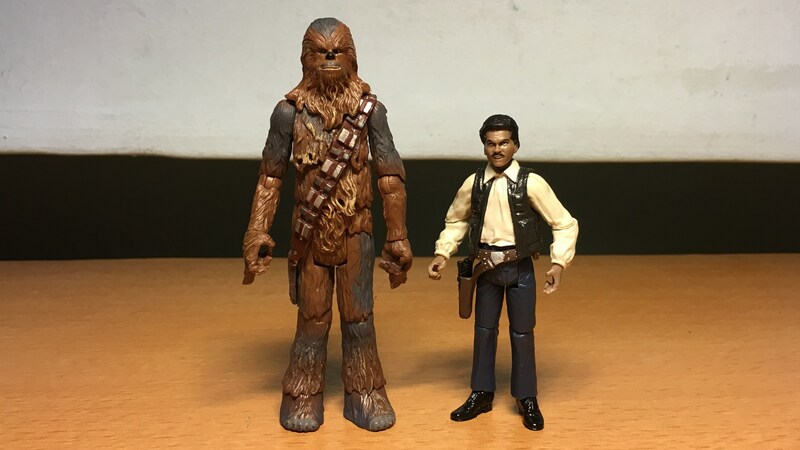 Now aligned with the Rebel Alliance, Lando joined forces with Chewbacca to track down Boba Fett and rescue Han Solo. Many fans ask why does Lando wear Han’s clothes. Lando then plays a part in Luke Skywalker’s plan to rescue Han Solo from the vile gangster Jabba the Hutt. Lando infiltrates Jabba’s palace by posing as a guard, and he later helps Luke, Han and Chewbacca escape during their execution. And this was part of the plan? Lando serves the Rebel Alliance with the rank of General, and he volunteers to lead a fighter attack to blow up the second Death Star. Lando pilots the Millennium Falcon to lead the attack on the Death Star. 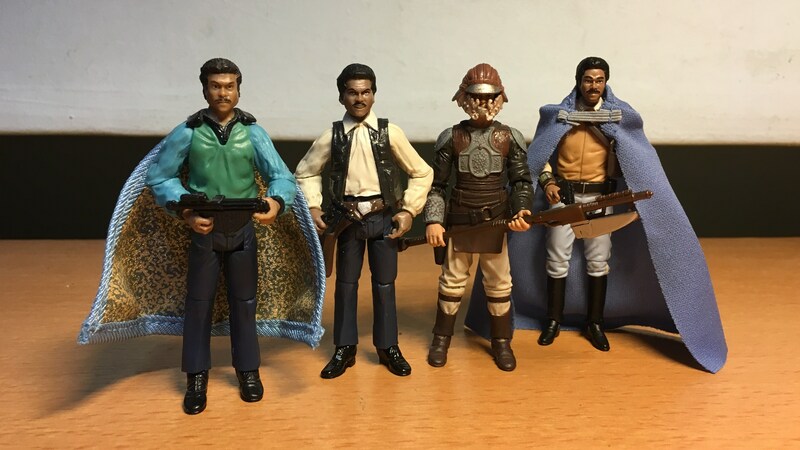 Lando goes casual for the mission, taking off his cape and gun holster. 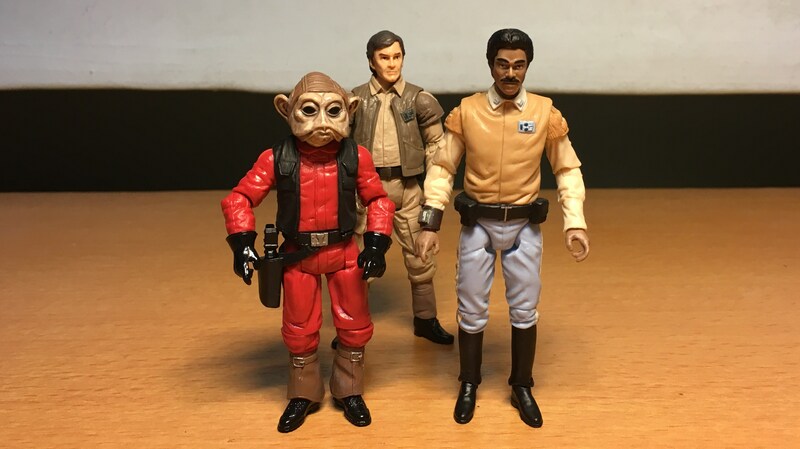 Even his copilot Nien Nunb changes from his B-Wing uniform to something a little more comfortable. A task force on the forest moon of Endor, led by General Han Solo, was able to deactivate the energy shield protecting the Death Star. This allowed the Millennium Falcon and other remaining fighters to fly into the Death Star and knock out the main reactor, causing a chain reaction that destroys the entire battle station. The Rebels then hold a celebration with the Ewoks to celebrate the death of the Emperor and the destruction of the second Death Star. 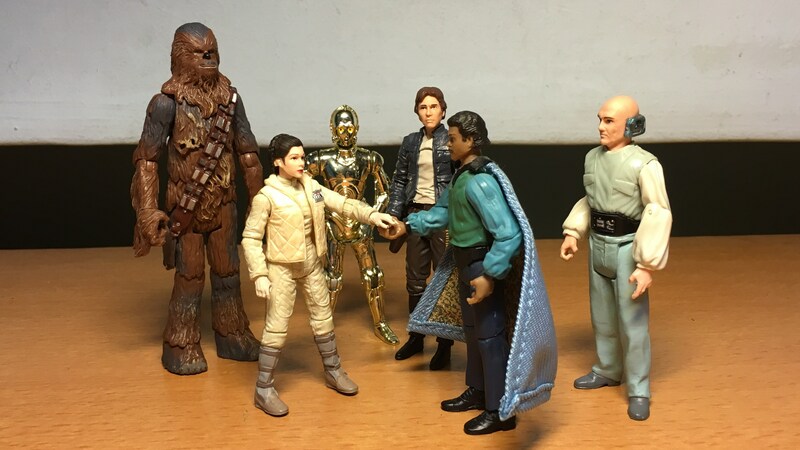 It’s hard to be sure, but Lando seems to have changed his shirt and jacket when he joined in the celebrations. The designs of the shirt and jacket are the same as the ones he wore on the Millennium Falcon, but their colours look somewhat different at the Ewok village. It could also be due to the lighting that they seemed (significantly) different though. Just one note: If you are thinking of buying a General Lando from the “Tunghori” on eBay, note that he does not come with the gun holster. I should have paid more attention to the display picture. 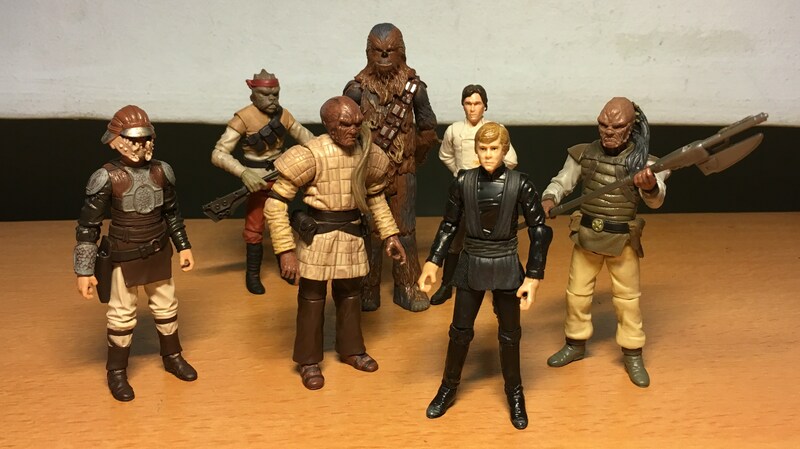 Here we have a comparison of several Skiff Guard Lando. 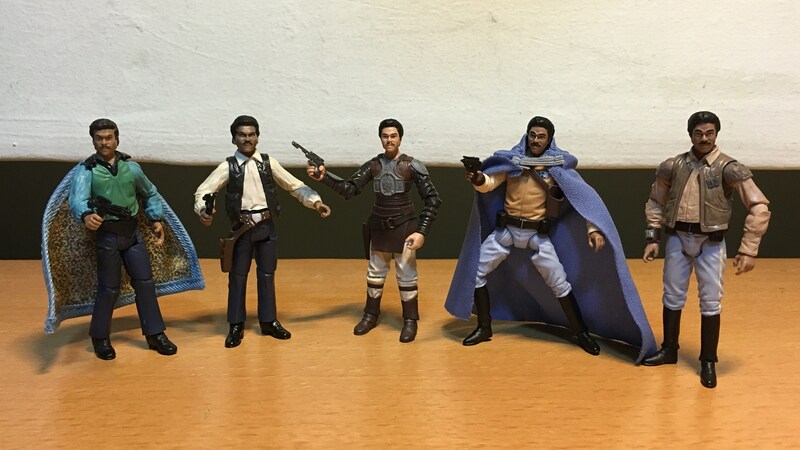 VC Lando Calrissian (Sandstorm Outfit) – This figure gets a bad rap for having too light a skin tone, and being much shorter than other Lando figures.